We are so fortunate to be part of such a warm, caring, and giving crafting community. With that being said, we would like to invite you to participate in a special card drive to help bring some love and happiness to others! Mother’s Day and Father’s Day are approaching and this can be a difficult time for seniors who are in nursing homes or shelters. We want these important people to feel loved, celebrated, and honored, and we need your help! We will be collecting handmade cards between March 14th and April 30th, and each donor is eligible to win one of FIVE $30 Altenew gift certificates! 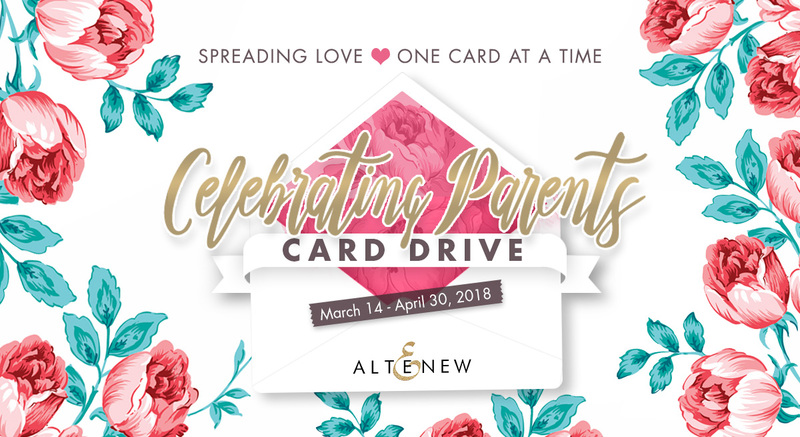 If you use #AltenewCardDrive when you share your Celebrating Parents cards on social media, you are entered to win one of THREE additional $15 gift certificates! The winners will be announced on Mother’s Day, Sunday, May 13th, 2018. Cards may be for Mother’s Day or Father’s Day. Sentiments should be generic – a specific greeting such as “so happy you’re my dad” wouldn’t really work. Please sign your name on the inside of each card. You may also include a note and where you are from! Include an envelope for each card you send, and make sure they are not sealed. We would love for you to use Altenew products, but of course, your cards may use products from other companies! If you have any questions or would like us to send cards to a local shelter or a nursing home near you, please email us at support@altenew.com with the subject line Celebrating Parents Card Drive. We have chosen five stamp sets that are great for your Mother’s Day and Father’s Day projects: Best Dad, Painted Rose, Penned Rose, Extra Special, and Best Mom. 20% of the profits from these stamp sets until Father’s Day, June 17th, 2018, will be donated to the Food Bank of Central New York to support seniors in need. This is another great way for you to show the support and the love in our crafting community! We hope you can join us for this great cause. Thank you for those who made this possible. We feel truly blessed to have your support! To celebrate this special card drive, we are planning an inspirational blog hop with prizes on 4/20/2018 so stay tuned! Thank you Altenew, what great causes! The paper crafting industry is the kindest, most generous group! What a wonderful and generous idea, I love it. I am not feeling well enough now, but as soon as I am able I will devote time for this great cause, I hope you are including the one’s in Syracuse, my Mom’s BFF of over 70 yrs is in the worst one there, sadly it breaks my heart and my mom’s I am going to send an email off to you if anyone needs some kindness is them. Sounds fun, I love doing card drive, that is the best thing card makers can do! Thanks for doing this! What a great idea! How kind. Hope I can make some cards. Although, I only have 1 Altenew stamp set so far. Does it have to have at least 1 Altenew product to be distributed? My own mother and father have been gone for years so I would love the opportunity to make cards for the drive. Thanks for helping make someone’s day brighter. I’ll do my best to send out some cards! Such a great idea and cause. The craft community is the warm and kindest in the world and I now for sure that there will be a lot of cards comming your way. What a wonderful opportunity – thank you for organizing this and the chance to spread some kindness to the elderly! Count me in! What a beautiful idea and a great cause!! For those of us that love making cards it’s not too difficult to share some handmade kindness and brighten someone’s day! Thanks for organizing this card drive AND thanks, ahead of time, for making a donation to the Foodbank of Central New York. This also is a very thoughtful and kind action. May Altenew continue to have great success as you desire to bless others with what you’ve been given! I have a question. I remember doing this for Christmas one year but the cards had to be a certain size. Do they have to be a certain size? I have envelopes for all sizes and I like to get very creative with big cards. I have lots of Altenew stamps but can I also repurpose some greeting cards? I have some greeting cards that are to pretty to throw away and I embellish them to make new cards out of them. I could embellish them with a few Altnew stamps too. I don’t know if I have any Altenew stamps for men or dad’s but I have some dad stickers. Since my dad died last March 20th I have no one to use them for. I will try to find some dad stamps that I have. Thank you for doing this. My dad was in and out of a home up the street from where I live and I know how much the people who lived there would have appreciated cards from us.